Mini Ms. Pacman Machine Built With #BeagleBoneBlack @TXInstruments @BeagleBoardOrg « Adafruit Industries – Makers, hackers, artists, designers and engineers! 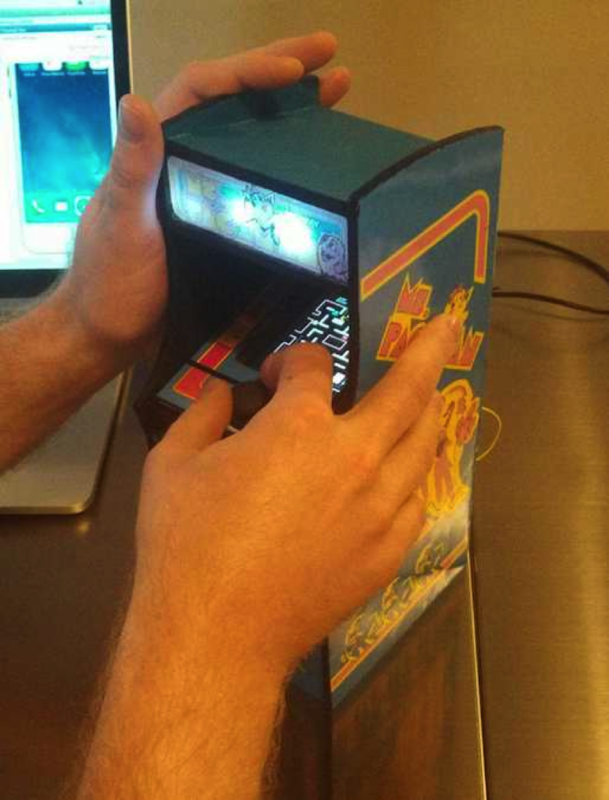 For this year’s Bring a Hack dinner after Maker Faire, I built a mini Ms. Pacman machine. My goal was to have a playable game in an enclosure that resembled the full size cabinet. Since I already had a Beaglebone Black sitting on the shelf, I decided to use it for the project. The electronics are pretty straightforward. It’s a Beaglebone Black with an Adafruit Proto Cape and the 4D Systems Display Cape. I consulted the wiring diagrams for the display cape to see what pins were not in use. I wired up the LEDs for the marquee to a digital pin (via the proto cape) and did the same with the one-player start button. I initially had planned to hook the analog stick up to some unused analog pins, but found that I couldn’t read their values. After some research, I discovered that the touchscreen driver basically monopolizes the ADC on the Beaglebone, so unless I was willing to mess with the driver, I’d have to come up with some physical solution. I thought about slapping in an external ADC, but I ended up just physically modifying the joystick. I cracked open the pots and scraped away the center electrical contact for both left-right and up-down. Then I wired the joystick up as a set of four digital switches to digital input pins. This worked fine. I was happy to discover I could power the whole contraption (USB audio included) off of the USB input on the Beaglebone. I wanted to make sure it would run all night at Bring a Hack, so I hooked it up to a 15 amp hour battery (for recharging cell phones) and did a test. I let it run for 8 hours, and it only used about a quarter of the capacity of the battery. Nice. It’s running the standard Debian Wheezy image for the Beaglebone Black. I compiled AdvanceMame on the BBB itself (took ages). I wrote a little python script which turns the marquee lights on during boot with the Adafruit BBB GPIO library – super easy. I then wrote a joystick ‘driver’ in python using the same GPIO library and the wonderful uinput library which creates a kernel uinput device and emits events. I was able to read the digital joystick pins and then emit uinput joystick events. Luckily, AdvanceMame was able to see these as jstick+ and jstick- events and map them correctly within the game. There was a fair amount of fiddling about getting the display positioned and rotated correctly on the screen, and getting the sound stable with AdvanceMame and Linux. I was getting a number of Linux USB stack crashes, which seemed to quiet down once I switched the sound driver to alsa in the AdvanceMame config. That’s about it. I didn’t take any photos during the build, unfortunately. I’ll upload some more finished pictures here soon.